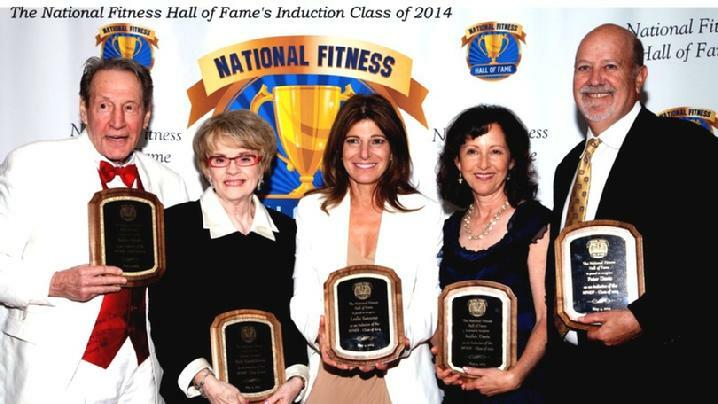 National Fitness Hall of Fame Superstars Gather forSpecial 10th Anniversary Induction Weekend! The ceremony has taken place at the beautiful Glendale Lakes Golf Club in Glendale Heights, Illinois for three straight years. “The facility, food and staff are all top-notch,” said John Figarelli, founder of the National Fitness Hall of Fame (and an Addison Trail graduate ’80). “We have been coming here since 2009 they always treat us well.” Addison’s own “Don of Sports,” Don Figarelli conducted the Red-Carpet interviews looking ever dapper in his traditional black tux. The house was packed as the crowd participated in an abundance of activities which included glamour shots, silent auctions, merriment and more. The eclectic Class of 2014 included Leslie Sansone (Walk-at-Home, Inc), Kathie & Peter Davis (co-founders of IDEA Health & Fitness Association), Beth Kuntzleman (President of Fitness Finders) and living legend, Bobby “Sugar” Hinds (Inventor and founder of LIFELINE Fitness). The Master of Ceremony, 2006 inductee, Tony Little got things started with his “You Can Do It” energy and humor as past inductee presenters; Tamilee Webb, Gilad Janklowicz, Tom Campanaro, Mark Rothstein and Brenda Dykgraaf all had wonderful things to say about the current year inductees. Brenda showed sincere tears of admiration as she introduced the vibrant octogenarian, Bobby, who dazzled and delighted the crowd with wit & humor.